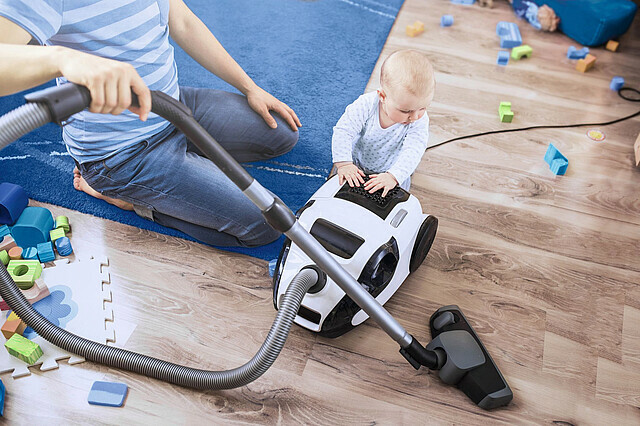 High quality filters increase the lifetime of the vacuum cleaner and protect users, especially allergy and asthma sufferers, from fine particles in the exhaust. In addition to removing ultra-fine particles, the outlet filters also capture microorganisms such as bacteria and mold. Freudenberg has developed a range of high-quality filters for bagless vacuum cleaners, including pre-filters, motor protection filters, high-efficiency filters (99.97% efficiency at 0.3 um or 99.95% at MPPS) for exhaust air, and carbon filters for odor removal. All filters are customized to the specifications of the vacuum cleaner manufacturers and to improve the performance of vacuum cleaners. Washable filters, functional treatment and HEPA filters in compliance with the EN1822 standard are available upon request. Our filters offer maximized collection efficiency, low air resistance, optimum air-permeability/intake performance, high dust-holding capacity, and a long lifetime. The combined electrostatic filtration effect and mechanical filtration efficiency are excellent for use in small spaces and can be customized to the necessary geometry of each individual application. The pre-filter is located in the air inlet of the vacuum cleaner to remove coarse particles and provide protection for the downstream filters. The pre-filter can be produced using nonwovens, mesh, foam or other filter medium and with rigid or soft frames. The motor protection filter captures coarse and fine particles, and protects the motor and fan unit. This exhaust filter captures ultra-fine dust particles, microorganisms, bacteria, etc. and is available at 99.97% efficiency at 0.3 um or 99.95% at MPPS. Washability and functional treatment are available upon request. All features are customized to customers’ specifications and to improve the performance of vacuum cleaners.